You will find below the steps to Disable or Completely Uninstall OneDrive from your Windows 10 computer, in case you have no plans of using OneDrive and do not want to be bothered by those annoying Setup OneDrive Pop-ups. As you must have noticed, Microsoft offers OneDrive as your default Cloud Storage Service in Windows 10 and keeps prompting you to Setup and start using OneDrive. While OneDrive is a convenient and cost effective Cloud Storage service, there are many users who have no plans of using OneDrive or any Cloud Storage for that matter. Also, there are others who use Google Drive, Dropbox and other Cloud Storage providers and do not want to see “Setup OneDrive” Pop-ups on their computers. 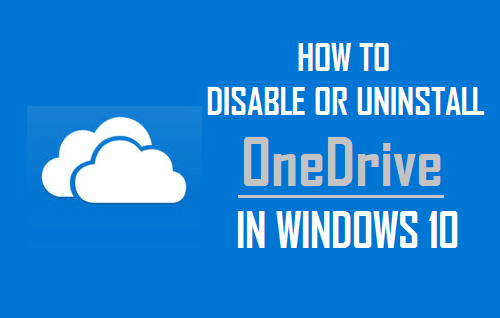 Hence, we are providing below the steps to Disable OneDrive from starting on your computer and also the steps to Uninstall OneDrive in Windows 10. 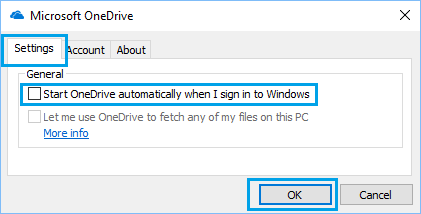 One easy way of dealing with OneDrive and its annoying “Setup OneDrive” pop-ups on your Windows 10 computer is to simply stop OneDrive from starting automatically on your computer. Once you do this, you will no longer be bothered by “Setup OneDrive” Pop-ups and the OneDrive App will not be starting on your computer. 1. 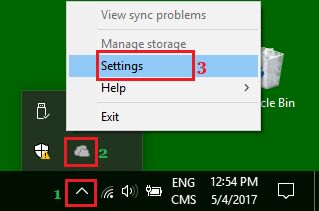 Click on the System Tray icon (1) located in the Taskbar of your computer and then right-click on OneDrive App icon (2). Next, click on the Settings (3) option in the contextual menu that appears (See image below). 3. 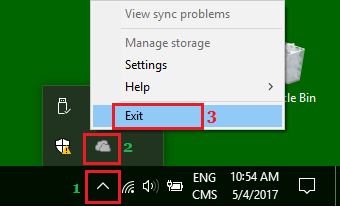 Next, click on the System Tray (1) Icon, right-click on the OneDrive Icon (2) and then click on Exit (3) in the little menu that appears (See image below). 4. Restart your Computer to save these Changes. After this, OneDrive will not be starting automatically on your computer and you will no longer be bothered by “Setup OneDrive” pop-ups. 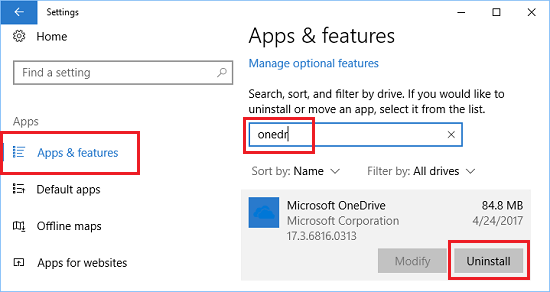 Follow the steps below to Uninstall OneDrive in Windows 10. This option is suited for those users who really do not want to use OneDrive and have no plans of using OneDrive at any time in the future. 1. Click on Windows 10 Start button and then click on the Settings Icon. 2. On the Settings screen, click on the Apps tab (See image below). 4. Click on Microsoft OneDrive to expand its entry, and then click on the Uninstall option (See image above). 5. You will see a pop-up, informing you that OneDrive App and all its related info will be uninstalled. Click on the Uninstall button to begin the process of Uninstalling OneDrive from your Windows 10 computer. In case you change your mind and want to make use of the free 5 GB OneDrive storage, you can Download and Install OneDrive on your Windows 10 Computer from any of the following two sources. 1. Download and Install the OneDrive Desktop Program, this will replace the OneDrive application that you had deleted from your computer. 2. Download and Install the OneDrive App as available at Microsoft Windows Store. This version of OneDrive is better suited for touch enabled devices.